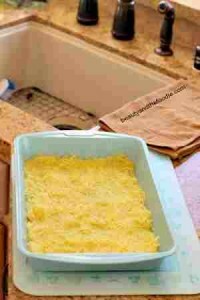 Pizza Squash Noodle Lasagna Bake is a grain free, low carb cheesy, saucy, meaty, spaghetti squash bake. 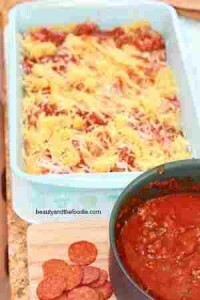 Pizza Squash Noodle Lasagna Bake is a grain free, low carb pizza flavored, spaghetti squash layered, lasagna bake. All of my favorite Italian foods combined in a dish (pizza, spaghetti, and lasagna). It is cheesy, meaty and saucy! Layered with ricotta, mozzarella, parmesan, and pepperoni goodness. 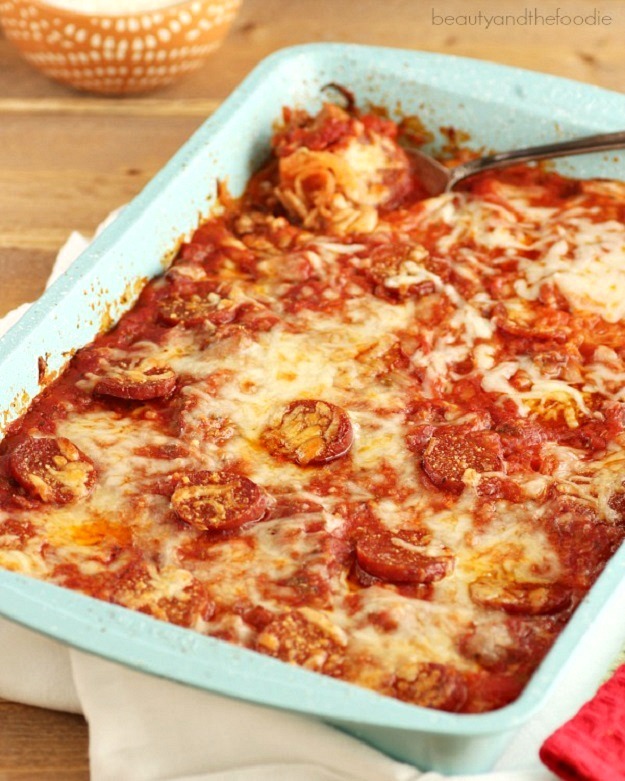 You just can’t go wrong here with this baked, Italian comfort food dish. Also include directions for easy whole spaghetti squash oven roasting. Poke holes all over squash. Bake whole squash for 60 to 65 minutes. 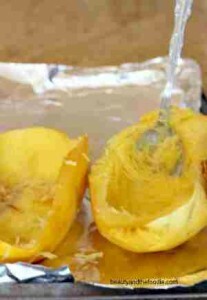 Cut cooled squash in half, and scrape out noodles with a spoon. Layer half of squash noodles on bottom of pan. pour half of sauce over noodles. Add ricotta, then the remainder of noodles , and the sauce. Top with pepperoni, mozzarella, and parmesan cheese. 1 lb ground beef, browned and drained of excess grease. Preheat oven to 375 F and line a shallow baking sheet. Using a sharp knife or metal skewer, poke holes all over spaghetti squash. 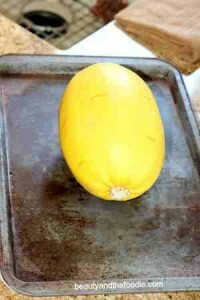 Place whole squash on a shallow baking sheet and bake for 60 to 65 minutes, turning squash half way through baking time. Remove squash from oven and let cool for 10 minutes. Preheat oven to 400 F for baking later. In a medium saucepan, over medium heat combine: 2 ¼ cups tomato sauce, 1 lb browned ground beef, 5 slices chopped pepperoni, 3 cloves minced garlic, 1 tbsp Italian seasonings, 1 tsp olive oil, and ¼ sea salt. Heat and stir to a low boil, then reduce heat cover and simmer for 10 minutes. Now you can easily cut in half the spaghetti squash and scoop out all the seeds. Then scrape with a large spoon the squash noodles and place in a large bowl. Remove marinara sauce from heat and let cool a little. Oil or grease a 13 x 9 inch casserole baking dish. Cover bottom of the dish with half of the spaghetti squash, then pour half of the marinara sauce over the top of squash noodles. Spoon small clumps of ricotta cheese over and across the top of the sauce. Layer the other half of squash noodles on top of the ricotta, then pour remaining marinara over the top of noodles. 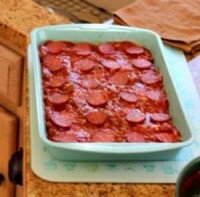 Then place pepperoni slices across the top of sauce. Sprinkle mozzarella cheese and Parmesan over the top. Bake for 25 minutes. Remove from oven, cool, and serve. 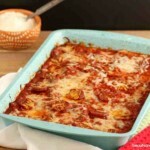 Pizza squash noodle lasagna bake is a cheesy, meaty, Italian, low carb comfort food. 1 lb ground beef browned and drained of excess grease. Preheat oven to 350 F and line a shallow baking sheet. Using a sharp knife or metal skewer, poke holes all over spaghetti squash. Place whole squash on the shallow baking sheet and bake for 60 to 65 minutes, turning squash half way through baking time. Remove squash from oven and let cool for 15 minutes. Preheat oven to 400 F for baking later. In a medium sauce pan, over medium heat combine: 2 ¼ cups tomato sauce, 1 lb browned ground beef, 5 slices chopped pepperoni, 3 cloves minced garlic, 1/2 tbsp Italian seasonings, 1 tsp olive oil, and ¼ sea salt. Heat and stir to a low boil, then reduce heat cover and simmer for a 10 minutes. Remove marinara sauce form heat and let cool a little. Oil or grease a 13 x 9 inch casserole baking dish. Cover bottom of dish with half of spaghetti squash, then pour half of marinara sauce over the top of squash noodles. Spoon small clumps of ricotta cheese over and across the top of the sauce. Just made this for dinner tonight. Another Beauty and the Foodie success! Last night we had the Chicken Bacon Biscuit Pot Pie (and leftovers for lunch :)), and I also have some Easy English Muffins cooking up right now :). 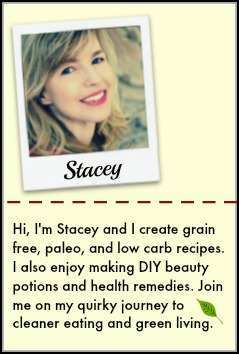 Thanks for helping to make the switch over to paleo much easier! 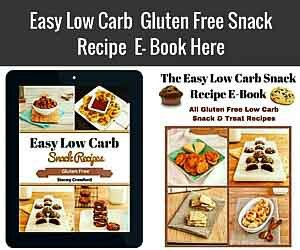 Alisha, thank you for trying another recipe and taking the time to comment 🙂 You’re very welcome & thanks for being so kind and supportive. Could this dish be made a day or two ahead of serving and be either frozen or kept refrigerated before cooking? 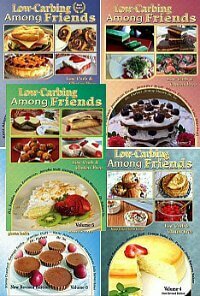 Lisa, I think it could be made it advance and refrigerated or frozen before baking. Just would need to adjust the baking time if frozen. I’ve been microwaving my spaghetti squash for years. Poke 3-4 times deeply…. micro for 6-10 minutes. Let cool, cut in half, remove seeds and fork it out as usual. The only time this failed, was when I didn’t poke it deeply enough… it blew up… spaghetti squash atomic bomb… ceiling, floor… across the room…LOL. 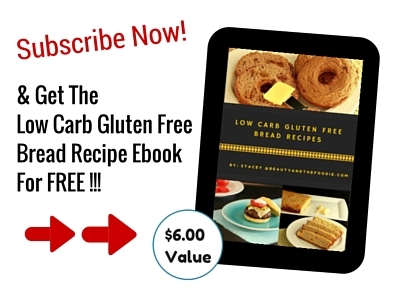 I can’t wait to try this recipe…all the goodness we love!! This was a huge hit with my kids and husband! Thank you!!! OR: Cut raw spaghetti squash in half, long ways. Put both pieces, face down on a microwave safe plate. Cook on high for 10-12 mins. The squash should give easily when pressed, check each end as well as the middle. My micro is very old, so I go for the longer time. OMG, That looks amazing woman! I’m going to have to make this stat! Many thanks Kelly, you are too kind.